First issued in 1921 to commemorate the 100th anniversary of Mexico's independence from Spain, the Mexican 50 Peso Gold Coin is also known as the "Centenario." The coin contains 37.5 grams of gold and was produced by the Mexican Mint. The front of the coin features an image of "The Angel of Independence", or "Winged Victory". She holds a laurel wreath in her right hand, and in her left are broken chains. 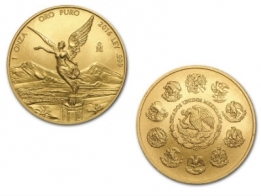 The background of the 50 Peso gold coin depicts several of Mexico's most famous volcanoes. The reverse of the coin features the Mexican coat of arms, with an Eagle standing above a cactus, holding a serpent in its beak. The 50 Peso design was later used for the Libertad series of coins, which is produced in gold and silver. The Mexican Mint stopped production of the 50 Peso coin in 2009. Mexico also release the Libertad coin series, which is available in gold and in silver. Please contact us to sell 50 Peso gold coins. View today's gold spot price.